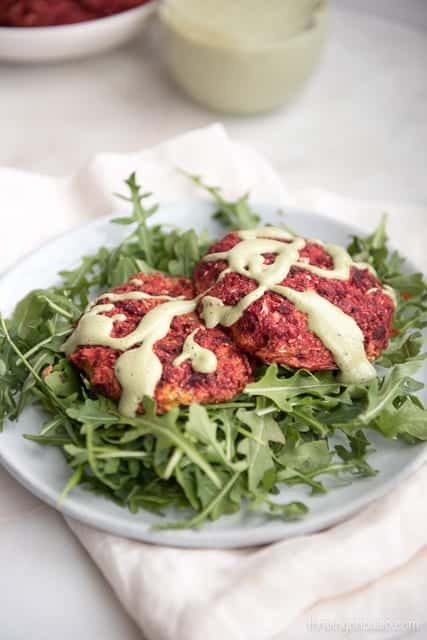 These Paleo, Whole30, and gluten-free beet cakes are a great side dish recipe or a main dish if you want less meat. And top it with the creamy dairy-free mint cashew cream for a nice pop of flavor. I’ve been on a less meat kick lately. Not sure if it has to do with my adrenals suffering from the puppy sleep torture or what, but while I enjoy eating meat, and know my body needs it, I just want less of it. Could be my body’s way of saying I’m not eating enough veggies perhaps? I know those of us on Paleo can easily get swept away with eating too much meat sometimes, especially during the winter when hearty things like roasts and meatloaves prevail. Because of this craving for more veggies, I’ve been cooking a lot of out some gluten-free vegetarian and vegan cookbooks I have as well as some websites. I am kind of obsessed with and make this Broccoli Flatbread by Green Kitchen Stories all the time (and promptly stick some meat on top of it), but I love it so much. After making their beet version (that I added some mayo, arugula, and roasted chicken thighs on) I wondered how a beet patty would be. 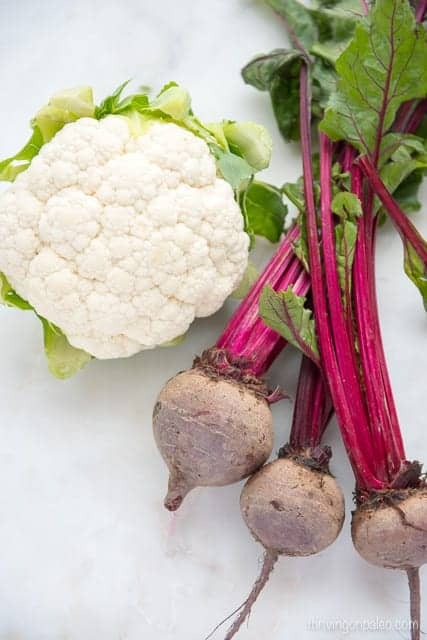 Like much more of the beet/cauliflower goodness to use as a side dish or as the main dish itself. So I set upon a food recipe experimentation that came out quite successfully! For some of you this might make a great dinner or lunch option all by itself. But I know there are others of you (er, husband, I am talking about you) that NEED some meat too. So use this as a hearty side dish instead. Might be a great dish for a Meatless Monday meal though! 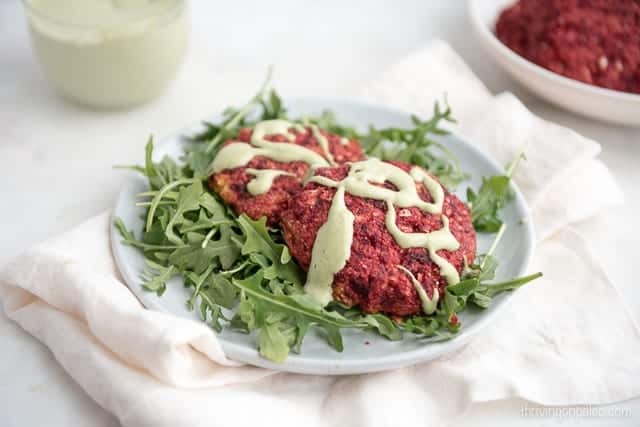 The cashew cream sauce is just a really nice dairy-free addition to the patties that compliments the beet flavor really well. Mint and beets are a classic combination, and the mint in this cream sauce is a nice subtle flavor. It isn’t like you get an in-your-face dose of mint like you just brushed your teeth. It’s just perfect for these patties. Ok, I am off to go try to take a nap since the puppy seems to be sleeping. Shhhh… don’t wake him – and enjoy the recipe for these patties! Preheat the oven to 375 F. Place parchment paper on 1-2 baking sheets. Cut the cauliflower into small chunks. Peel the beets and cut into small chunks. Put the cauliflower and beets into a food processor and pulse until everything is uniform size and about the size of a grain of rice. You may have to remove some remaining large chunks and process those by themselves. Put the beet/cauliflower mixture into a large bowl and then add the almond flour, eggs, salt and pepper. Mix well. Using your hands, make patties with about a plum-sized amount of the mixture. These will be about the same size as a ground beef hamburger patty. Place on the prepared baking sheet(s) and flatten to about 1/2 inch thick. Bake in the oven for 25 min. If the patties don’t seem set (they stay together when lifted with a spatula) bake for another 5-10 min. Put the drained cashews, water, salt, and mint into the blender and blend until very smooth. If it’s pretty thick, use more water until desired thickness. (It will thicken in the fridge too). These are beautiful! Perfect for Valentine’s Day or any day! Beets are one of my favorites! Thanks Emily. Beets are so yummy! I absolutely agree with the meat thing – and I think you are onto something with meat in relation to adrenal fatigue. I have found the biggest jumps in my adrenal healing when I back off to once a day on the meat and focus more on mineral rich veggies to feed my tired mineral status! These look great! Thank you for sharing! Thanks Renee – interesting that you feel the same way. Guess we are just good at listening to our bodies! Hooooly cow I needed this recipe to finally break through my mindset that I’m terrible at cooking beets! Trying this asap! Haha, I hope this totally changes your mindset! Those are just soooo pretty! And the mint cashew cream sounds dreamy! I’m obsessed with cashew cream! Thanks Cristina! Cashew cream is so good. Funny because it can be so much creamier than real cream! Beets are so healthy and good for you and I especially love the color. Thanks for this lovely recipe ! Yeah, my functional medicine practitioner is always telling me to eat beets! So good for you! These are so pretty- I just love the color! What a great side dish and that cashew mint cream sauce looks amazing! Oh that mint cashew cream! I bet it would be good on so many things. Ha, you bet I’ve tried it on a whole bunch of things this week 🙂 It was really good over some leftover roasted broccoli I had made too! Thanks Irena! I thought of you when making this since you always make the best less-meat Paleo dishes! I love this! So pretty AND healthy. I have to try it! Oh man, I love roasted beet salad with goat cheese. But alas, dairy-free is my future so yeah, options like this are important. Great recipe, the mint cashew cream has got me a bit excited. Never heard of those flavours together but I can imagine it working really well (and it looks so nice on the picture). Will definitely give that a go! Thanks Mark! Hope you enjoy! I’ve been on a less meat kick lately too because I have so much more energy, so I’m loving this super creative recipe! What is it with us and the less meat kicks? haha. Guess we just are really good at listening to our bodies after all this practice. 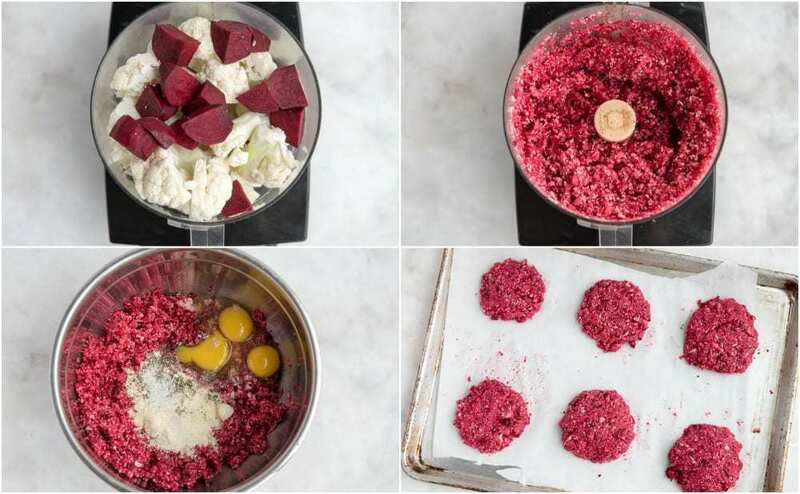 Beet cakes–such a cool idea! Love cashew cream and bet it’s great with a little mint. This looks so interesting and lovely. The flavors for this recipe must be amazing. I can’t believe I’ve never tried beet cakes!! These look perfect! !